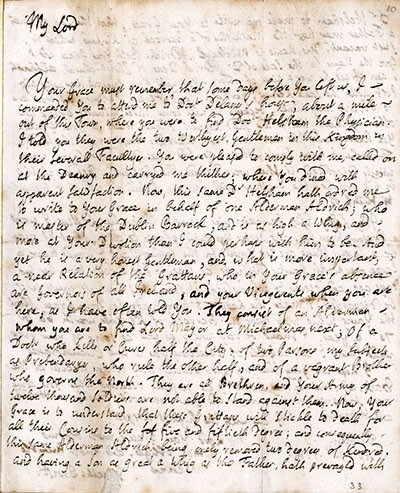 A two-page signed autograph letter by Jonathan Swift (1667-1745) dated April 15, 1735 to an unidentified Lord (i.e. Lionel Cranfield Sackville, the 1st Duke of Dorset and Lord Lieutenant of Ireland 1731-1737) is being offered by Nate D. Sanders Auctions in its sale ending January 30, 2014 at 5PM Pacific. The opening bid is $5,000. With customary wit, sarcasm, irony, and playfulness, Swift, at the time Dean of St. Patrick's Church in Dublin and a political exile, asks the Duke to appoint the son of a local Alderman to Mastership of a barrack at Kinsale, a post that had recently become vacant. Politics is never far from Swift's mind. A Tory propagandist, he pokes fun at the Whigs. The Alderman, "is as high a Whig and more at your devotion than I could perhaps wish him to be." 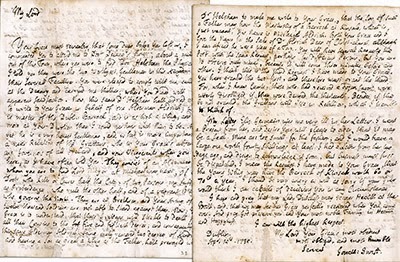 Swift refers to "a Doctor who kills or cures half the city, of two Parsons my subjects as [illegible] who rule the other half, and of a vagrant Brother who governs the North." 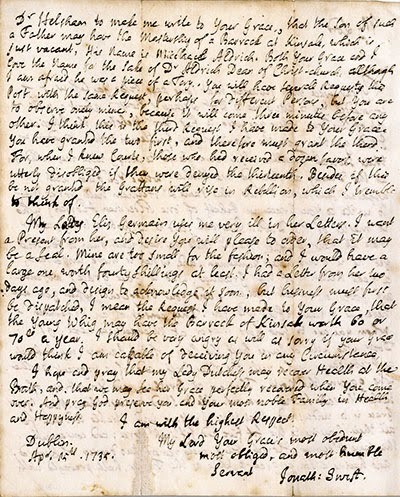 He also mock-demands of the Duke that he order Lady Elizabeth "Betty" Germain (1680-1769), a friend and close correspondent of both and a very wealthy woman who "uses me very ill in her Letters," to give him a present "worth forty shillings at least." Your Grace must remember, that some days before you left us, I commanded you to attend me to Doctor Delaney's house, about a mile out of this Town, where you were to find Doctor Helsham the Physician. I told you they were the two worthyest gentlemen in this Kingdom in their severall Faculties. You were pleased to comply with me, called on at the Deanry and carried me thither; where you dined with apparent satisfaction. Now, this same Dr. Helsham hath orderred me to write to Your Grace in behalf of one Alderman Aldrich; who is master of the Dublin Barrack, and is as high a Whig and more at your devotion than I could perhaps wish him to be. And yet he is a very honest Gentleman, and which is more important, a near Relation of the [political family] Grattans, who, in Your Grace's absence are governors of all Ireland, and your Vicegerents when you are here, as I have often told you. They consist of an Alderman whom you are to find Lord Mayor at Michaelmas next; of a Doctor who kills or cures half the city, of two Parsons my subjects as [illegible] who rule the other half, and of a vagrant Brother who governs the North. They are all Brethren, and your Army of twelve thousand soldiers are not able to stand against them. Now, Your Grace is to understand, that these Grattans will shickle to death for all their Cousins to the five and fiftieth degree; and consequently this same Alderman Aldrich being onely removed two degrees of Kindred and having a son as great a Whig as the Father, hath prevayled with Dr. Helsham to make me write to Your Grace, that the son of such a Father may have the Mastership of a Barrack at Kinsale, which is just vacant, His name is Michael Aldrich. Both Your Grace and I love the name for the sake of Dr. Aldrich Dean of Christ-church, although I am afraid he was a piece of a Tory, you will have several Requests this Past with the same Request, perhaps for different Persons, but you are to observe only mine, because it will come three minutes before any other. I think this is the third request I have made to Your Grace. You have granted the two first, and therefore must grant the third. For, when I knew Courts, those who had received a dozen favors, were utterly disobliged if they were denyed the thirteenth. Besides, if this be not granted the Grattans will rise in rebellion, which I tremble to think of. My Lady Eliz. Germain uses me very ill in her Letters. I want a Present from her, and desire you will please to order, that it may be a seal. Mine are too small for the fashion; and I would have a large one, worth forty shillings at least. I had a Letter from her two days ago, and design to acknowledge it soon, but business must first be dispatched, I mean the Request I have made to Your Grace, that the young Whig may have the Barrack of Kinsale worth 60 or 70 lb a year. I should be very angry as well as sorry if Your Grace would think I am capapble of deceiving you in any circumstances. I hope and pray that my Lady Dutchess may recover Health at the Bath, and, that we may see her Grace perfectly recovered when You come over. And pray God preserve and your most noble Family in Health and Happyness. Historian, playwright and novelist Horace Walpole (1717-1797) wrote of Lionel Sackville: "with the greatest dignity in his appearance, he was in private the greatest lover of buffoonery and low company…" Swift thought him one of the most agreeable and well-informed of men, and the best conversationalist he had ever met. Theirs was a deep friendship based upon a shared point of view and sense of humor. Images courtesy of Nate D. Sanders Auctions, with our thanks.